It has happened to me more than once in my lifetime that a person will come to me and tell me something about what will happen next. It is usually a very specific bit of career advice from someone I know but not well; it is normally not someone I would seek out for counsel. And every time it is the same thing: the person will see me out at a social gathering – often at a gathering in which it was not a given that I would be there – and announce to me ‘I have a message for you,’ as if they had just listened to a voice mail addressed specifically to me. When that happens, I know to listen: the person will invariably tell me something that I need to know about what will happen next. “Texas?” I ask, wondering. “Why Texas?” As a matter of fact, I do have a list of ‘places where I would not want to live’ in my head, and ‘the plains of Texas’ is a location high on that list. As far as I am concerned, they call it ‘plain’ for a reason. At that point in the process, I had not even mapped out what precisely I wanted to do. So I took her comments under advisement. A month (two months?) later, I had come to the (somewhat surprising) conclusion that I really wanted to go back to congregational work. I love academics, of course, but I realized that I missed that element of transcendence that hovers over the work of a rabbi. “Texas is fine;” I tell him, “I am open to living in any location.” Yes, even the plains of Texas. Perhaps I would find something to love about the wide-open spaces. As it happened, the place where I went to work was not Texas; it turned out to be a small congregation in a college town in northern New York. I cannot give you a good reason why this phenomenon takes place; I simply cannot explain it. I can tell you that the Bible records several instances of a person – ‘ish’ – who appears mid-narrative with instructions as to what will happen next. Joseph, for example, finds his brothers after encountering such a person. The person’s instruction is not necessarily one that makes the road smooth; rather, it is an announcement of what needs to happen next. And it has happened enough times now that I heed its call. How does this relate to the month of Elul, and the concept of wonder? We are able to exploit, to label things with well-trimmed words; but when ceasing to subject them to our purposes and to impose on them the forms of our intellect, we are stunned and incapable of saying what things are in themselves; it is an experience of being unable to experience something we face: too great to be perceived. I am, of course, an academic as well as a rabbi; I am nearly finished with a PhD; I value highly the work of the intellect. But, as Heschel reminds us, this emphasis on our capacity to name and categorize might at times push us away from apprehending the truth. There are times when we best encounter meaning when we drop our categories and our names and simply abandon ourselves to wonder. As I said: I cannot tell you why it happens, any of it; I can only stand in wonder. Kari Tuling serves as the rabbi for Temple Beth Israel, in Plattsburgh, New York. Plattsburgh is in northern New York, not far from Montreal. 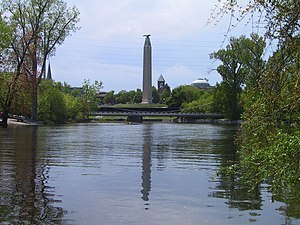 Located on the shores of Lake Champlain, at the foot of the Adirondack mountains, it is also home to SUNY Plattsburgh. Kari plans to learn how to snowshoe and cross-country ski, two activities she had never considered before. Abraham Joshua Heschel, Man is Not Alone: A Philosophy of Religion (New York: The Noonday Press, 1994), p. 36.